beauty | Are We There Yet? I hardly ever buy beauty products. They are SO expensive and I usually don’t feel like I see much of a difference. So, I always love finding DIY versions on Pinterest. 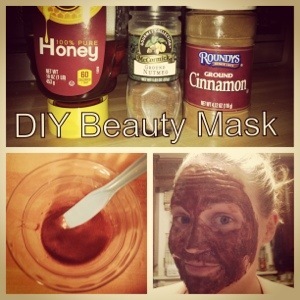 I came across a recipefor a cinnamon, nutmeg, honey beauty mask. It stated that nutmeg and honey reduce swelling and redness in your skin, as well as soothe acne scars and prevent infection. So, as I always have all three of those on hand, I decided to give it a try. Mix all together into a paste. Apply on skin and leave on for 30 minutes. Mine became kinda drippy at the end. I hopped in the shower and took it off by rubbing in a circular motion and it really exfoliated my skin as well. This recipe is a winner. My skin looks brighter, feels softer and much shiner. Let me know how it works for you!